This bloom unfolds into beautiful birds perched in a golden nest surround by green. Not only is it visually surprising, but the taste is surprisingly spicy and reminds one of autumn, like pumpkin pie!. One of the favorites at Alice’s Fine Teas, a delicious, warm, soothing tea. Ingredients: Marigold (believed to help circulation and ease stomach ache), Lily (said to enhance energy and to have a cooling effect) and Silver Needle Tea. 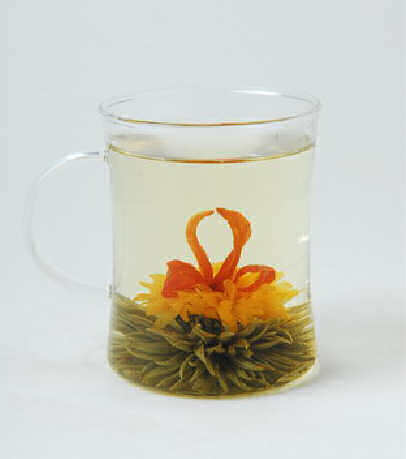 I enjoy blooming teas, but I don’t really brew them very often. I blame the gadgetry – I am a self-professed anti-gadgetite (I just made that up) – and when I brew a blooming tea, I have to watch it brew, right? I guess I am just going to have to promote my glass teacup to the status of essential tool rather than its current status of “gadget” so that I can enjoy the beautiful art of blooming teas! I steeped this bulb for four minutes in 165° F water and after the four minutes, the bulb had not completely opened. Only a hint of the orange-y blossoms that would display was showing at the very top of the bulb. But this is a good thing! It means additional infusions… which means MORE tea! Yay! This really DOES taste like pumpkin! There are very gentle spice notes in the background, which contributes to the “pumpkin pie” like taste that is mentioned in the above product description from Alice’s Fine Teas. I wouldn’t say it tastes just like pumpkin pie – but it does have similar characteristics. The squash flavor is distinct … and quite yummy. The tea has a very pleasant sweetness to it (I don’t recommend adding sweetener to this tea, it would overwhelm the delicate flavors!) and a light yet smooth mouthfeel. Very little (almost no) astringency to this cup. A very pleasant, mild cup of tea that makes for an excellent topic of conversation as well as a refreshing beverage. For the second infusion, I steeped for five minutes and achieved another delicious cup of tea. The bulb had not yet fully opened until I infused for the third time (for six minutes), and the tea was still quite lovely, although the pumpkin flavor had subdued a bit by this time. There were still faint notes of squash and spice, but mostly what I tasted by this time was the soft, fresh notes of silver needle with a delicious buttery finish. When the bulb finally did completely open, I enjoyed the sight – it looked like two swans dancing (ever go to Disneyland and watch the swans in the pond outside of Sleeping Beauty’s castle? Every hour when the sounds of a singing Sleeping Beauty can be heard, the swans dance together). This was an incredibly fun tea to steep and to drink. The flavor was delicious and surprising, and the colorful display from the bulb made tea time all the more entertaining.